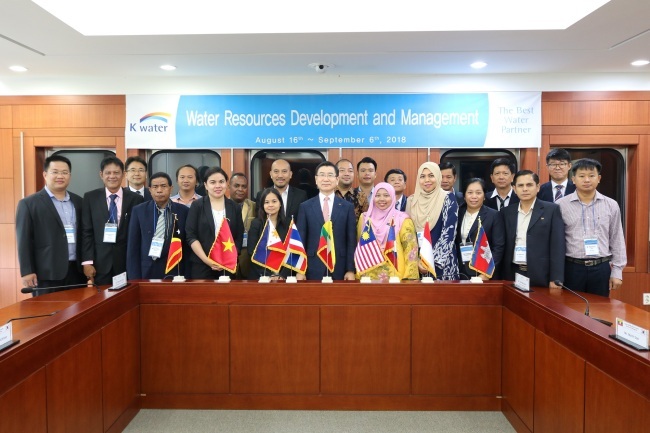 The state-led Korea Water Resources Corp., also known as K-water, has invited 18 public servants from Southeast Asian nations to a seminar designed to help enhance the capability to manage water resources. The seminar dubbed “Water Resources Development and Management” kicked off Monday and runs through Sept. 6. Held in Daejeon, a city 140 kilometers south of the capital city Seoul, the seminar is co-sponsored by K-water and the Korea International Cooperation Agency. K-water invited officials from nine countries -- East Timor, Laos, Myanmar, Malaysia, Vietnam, Indonesia, Cambodia, Thailand and the Philippines -- which have often faced difficulties in water resource management due to frequent typhoons or floods. During the seminar, some 20 Korean experts will give lectures that revolve around ways to set up government policies for water resources management, the operation of dams and water supply systems, as well as techniques for water purification and quality control. K-water has offered educational opportunities to some 4,000 people across some 100 countries since 1997.